7. Select "Empty" template. Select "Razor" as the ViewEngine. There are 2 built in view engines - Razor and ASPX. Razor is preferred by most mvc developers. We will discuss about Razor view engine in detail in a later video session. 8. At this point you should have an mvc application created. Notice that in the solution explorer, you have several folders - Models, Views, Controllers etc. As the names suggest these folders are going to contain Models, Views, and Controllers. We will discuss about Models, Views, and Controllers in a later video session. 4. Leave rest of the defaults and click "Add"
We should have HomeController.cs added to "Controllers" folder. At this point run the application by pressing CTRL+F5. Notice that you get an error as shown below. Change the return type of Index() function from "ActionResult" to "string", and return string "Hello from MVC Application" instead of View(). Run the application and notice that, the string is rendered on the screen. When you run the application, by default it is using built-in asp.net development server. Let's use IIS, to run the application instead of the built-in asp.net development server. 1. 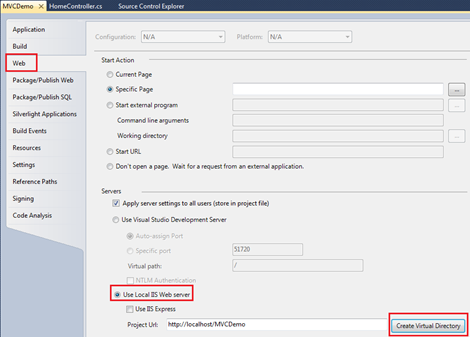 In the solution explorer, right click on the project and select "Properties"
Run the application, and notice that the URL is "http://localhost/MVCDemo/"
Now change the URL to "http://localhost/MVCDemo/Home/index"
In the URL "Home" is the name of the controller and "Index" is the method within HomeController class. So the improtant point to understand is that the URL is mapped to a controller action method. Where as in web forms application, the URL is mapped to a physical file. For example, in a web application, if we have to display the same message. 3. The Page load event gets executed and the message string is displayed. 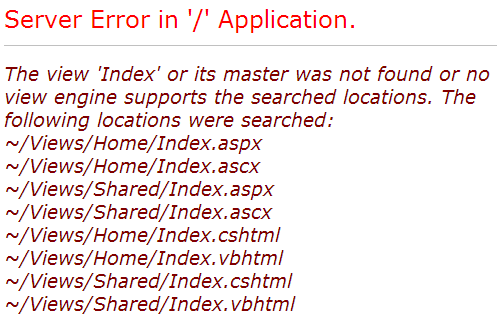 In properties -web i could not find "Use Local IIS Web Server" radio button. kindly do the needful. If you are using Visual Studio 2013 there will not be the option for "Use Local IIS Web Server" radio button. Then, you should see a checkbox for "Apply server seetings to all users (store in project file) This should be checked by default. If it is then make sure the drop down list has "IIS Express" selected. This was my default. Next, for "Project Url" make sure that matches what was said in the tutorial. ("http://localhost/MVCDemo/Home/index") IMPORTANT: if there is a port number listed in the Project Url such as mine ("http://localhost:62805") make sure you keep that when you change it. Mine ended up being "http://localhost:62805/MVCDemo" You will need to then click the "Create Virtual Directory Button and you will likely be prompted to create the virtual directory. As a side note, if you are curious, like me, and want to know where it puts these settings at you will want to navigate to C:\Users\[USERNAME]\Documents\IISExpress\config and the settings are placed in the applicationhost.config file. Please help.... I did whatever u told...but this error is coming.... The Web server is configured to not list the contents of this directory. Did you build the project? please suggest what i write in web config file? Hello sir, when i run this project showing an error.."unable to launch iis express web server port 80 is in use"
how to resolve it sir. Sir I am Student When I Run this Prog As Per Instruction. cannot debug some of code in process w3wp.exe. Dear Sir, Thanks for your videos. It is very useful. You are so nice that you are sharing your knowledge with so many people. I have a issue while following this - I am new to MVC platform. when I click cntrl F5 after creating the controller file. Is there any additions in View has to be done. Your tutorial as well as video is awesome and unique way of teaching. Kindly provide webserver tutorial which includes lifecycle of iis after running our asp.net application how iis starts trigerring from top to bottom. The requested page cannot be accessed because the related configuration data for the page is invalid." when i run this project showing an error.."unable to launch iis express web server port 80 is in use"
While Creating Virtual Directory is it compulsory to provide a port number? I did as you said but it shows the directory as " http://localhost:5804/MyFirstMVC " and while running it doesnt shows Controller name or index.Can you help me to figure it out?